Make it in the games industry with the new issue – out now. 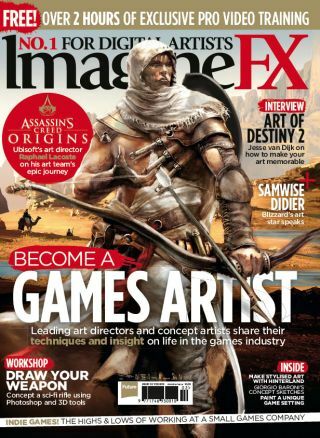 Industry experts reveal what it takes to succeed in the games industry in ImagineFX 157 – on sale now! Computer games graphics and art styles have come a long way since Pong and Pac Man, and there are plenty of opportunities for artists to get involved and shape how digital worlds look. Take Raphael Lacoste for example, the art director behind the huge Assassin's Creed series. We talk to him to discover how he tweaks the world around him into an immersive space that players can spend hours exploring. Elsewhere in issue 157 we look inside Giorgio Baroni's sketchbook and discover why he likes to mix concepts from the past and the future, plus in his workshop, Elijah McNeal shows you how to create a futuristic weapon. On top of that there's reader's art in our FXPose, and reviews of all the latest tools and books. Bursting at the spine with creative inspiration, you won't want to miss ImagineFX issue 157! Check out what's in store with a look at the lead features, below. Small studios have got their work cut out for them. Not only do they have to compete with triple-A studios, but they also have to achieve amazing results with fewer people. It's not all hard work though, as we find out when we chat to artists from small games studios and discover their unique benefits. Reality is all around us, so why try and recreate it? That's the thought process of Raphael Lacoste, the art director behind the phenomenally successful Assassin's Creed franchise. Discover how he uses reality to create new environments with our in-depth interview. With his work as a video game art director, Jesse van Dijk wants his work to be three things: relatable, memorable, and surprising. While it's rare for one image to nail all three, a voyage through his portfolio reveals how he successfully created a "mythic science-fiction world" for Destiny 2. Ever thought about creating your very own video game character? With this workshop from concept artist and illustrator Devon Candy-Lee you'll learn how she creates an avatar with a character and an identity all of its own. ImagineFX is the world's best-selling magazine for digital artists – packed with workshops and interviews with fantasy and sci-fi artists, plus must-have kit reviews.